How much each state receives is determined so that if each state applied similar state-based taxes, the revenue from state taxes plus their GST share would fund similar levels of state government services to its citizens – fiscal capacity. South Australia, Tasmania and the Northern Territory are all currently net recipients of GST – they receive more than they pay in. The federal government promises to subsidise the transition to a new formula for carving up the GST revenue, after rejecting an alternative proposed by the Productivity Commission inquiry it ordered. The government’s plan, to be released by Treasurer Scott Morrison on Thursday, would ensure the fiscal capacity of all states and territories was “at least the equal of NSW or Victoria, whichever is higher”. “Benchmarking all states and territories to the economies of the two largest states will remove the effects of extreme circumstances, like the mining boom, from Australia’s GST distribution system,” Morrison said. A “floor” would also be set, below which no state could fall. From 2022-23, this would be 70 cents per person per dollar of the GST, rising to 75 cents from 2024-25. The changes follow years of complaint by Western Australia, after its share of the GST revenue fell drastically. The GST has threatened to be a federal election issue in WA, where the Liberals have several vulnerable seats. In its report, commissioned by Morrison last year, the PC recommended distribution being equalised on an average of all states and territories. But Morrison said the PC’s model would move too far from the “fair go” principle – it would risk leaving behind the smaller states. As well, it would cause “unnecessary disruption and transition costs that most states, and the Commonwealth, would not be able to reasonably accept or absorb”, he said in a statement. The PC report was sent to the states and territories on Wednesday. When details started leaking late Wednesday Malcolm Turnbull quickly declared its proposed model had been rejected. He told a news conference that under the government’s plan “no state will be worse off and indeed every state will be better off”. The transition to the new system would be over eight years from 2019-20, eased by funds from the federal government. Short term untied funding would be given over three years from 2019-20 to ensure no state received less than 70 cents per person per GST dollar. Also, Morrison said, “a fair and sustainable transition to a new equalisation standard will be ensured through an additional, direct, and permanent Commonwealth boost to the pool of funds to be distributed among the states”. The Commonwealth would put in $600 million in 2021-22, with a second injection of $250 million in 2024-25. The additional Commonwealth funding would be indexed. Morrison will go on a road show to sell the plan to the states, with a special meeting of the Council on Federal Financial Relations to be held in September. The government is aiming for agreement on transition arrangements being reached by the end of the year. Morrison said: “This will be the first time real changes have been made to fix problems in how the GST is shared since the GST was introduced almost 20 years ago”. In its report, the PC said the current approach to horizontal fiscal equalisation (HFE), though having strengths, “also has significant weaknesses. Reform and development opportunities are likely being missed at the expense of community wellbeing over time”. While equity should remain at the system’s heart, “there is a need for a better balance between equity and efficiency”. The Commonwealth should set a revised objective for HFE “to provide states with the fiscal capacity to deliver a reasonable standard of services,” the PC said. The present system “seeks to give all states the same fiscal capacity to deliver public services. To do this, all states are brought up to the fiscal capacity of the fiscally strongest state”. The original story has been corrected – it wrongly said that state consent was needed for the change. Morrison told a news conference on Thursday he wanted state and territory agreement, but it is not formally required. 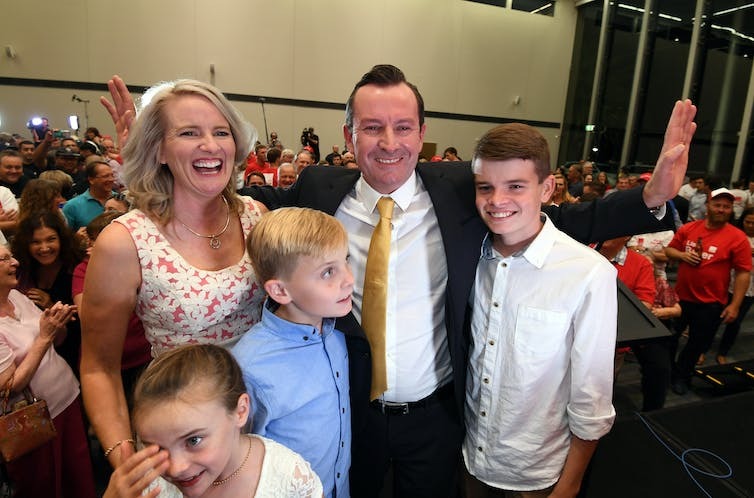 The Labor Party faces a byelection in the seat of Perth after first-term MP Tim Hammond announced he was leaving politics because of the difficulties of being separated from his young children. His children are aged six, two-and-a-half and seven months. “As a direct result of me being away from home, the strength of the relationships that I have built with my children have suffered in a way that is simply unsustainable for us as a family, and me as a dad,” he said. Hammond, 43, elected in 2016, was already a shadow minister and was seen as having a very bright future in politics. He said he would leave politics entirely, ruling out any future tilt at state parliament. He planned to go back into the law, representing the sick and dying, and Aboriginal victims, while being “at home every night”. Hammond is well respected on both sides of politics. Finance Minister and fellow Western Australian Mathias Cormann said he was “genuinely sad” to hear Hammond would be leaving. “While we are political competitors, we are also friends and colleagues involved in the same profession focused on making a positive difference to our community and to our country. Tim is a very decent, highly capable individual with a bright future in whatever he decides to do next,” Cormann said. “It is our state’s loss that Tim will now not continue to pursue his federal political career to its full potential,” he said. The electorate of Perth is considered a safe Labor seat and is on a margin of 3.3%. Labor was already waiting anxiously on the High Court’s decision on the status of ACT Senator Katy Gallagher, which is expected to indicate whether three House of Representatives Labor members and one crossbencher will have to face byelections as a result of dual citizenship issues when they nominated in 2016. Hammond said he would resign “in the near future” after discharging obligations to his electorate and staff. He said he very much regretted that a byelection would be an inconvenience for his community. “The decision to cause a byelection now is the thing that gave me the greatest angst,” he told reporters. In a detailed statement explaining his decision, he said that “as much as I have tried desperately, I just cannot reconcile my life as a federal member of parliament with being the father I need and want to be”. He said he had privately agonised over his decision for many months. In a Perth radio interview he said the baby in his family had been “an unexpected but wonderful blessing that wasn’t on the cards when I was elected almost two years ago”. He said he had spent many years seeking to become an MP. But now “it just wasn’t working”. It was very important to him as a professional person that he give the job 120%. At a news conference Hammond said the travel – which is often mentioned in relation to MPs from WA – was just one part of it. It was not so much the travel per se – it was just “about absence”. To do his job properly, he had to put down his bags and immediately get out again, to fulfil his obligation to the community. He said Opposition Leader Bill Shorten had been “understandably surprised”, wanting to make sure he had thought through his decision. Shorten said that he was disappointed Hammond would not be part of the next caucus, “but as a husband and a father, I’m glad he’ll be with the people he cares about most in this world”. Party leaders are critical to their party’s performance, and arguably have become even more so in an age in which voter loyalties have frayed and partisanship is on the wane. It is for these reasons that a government’s electoral defeat is often the catalyst for vanquished premiers and prime ministers to stand aside from the leadership of their party and to quit the parliament. This is not a legal or constitutional requirement, nor is it necessarily an expectation held by voters. Rather, it is more akin to an informal rule that is invoked following a government’s defeat so as to clear the path for the incoming leadership team. The reasons why such a practice exist was recently brought into sharp focus when the former Western Australian premier, Colin Barnett, found himself at the centre of calls from the Liberals’ new leader, Mike Nahan, and some media commentators, to quit the parliament. Barnett rejected these suggestions. The question of whether a former premier has an obligation to resign depends in part on what one thinks the role of a political representative is, and to whom they owe their allegiance. For those who have sympathy for the partisan model of representation, former leaders should generally quit the parliament if this is what their party asks of them. However, for those who subscribe to the view that elected representatives have obligations to the wider community (trustee model) or to the constituency that directly elected them (delegate model), then there is a much stronger case to be made for them serving out their full term, regardless of their former status within parliament. The partisan model of representation would suggest that Barnett should quit the parliament, if this is desired by his party, in order to bring renewal within their ranks or help refocus the team following defeat. This model positions the elected member as agents of the party, who owe a duty to their party because of the support they received and the opportunities that their party provided for them. Elected members are expected to place the party interest ahead of personal interests. On these grounds, the Liberals have a strong case against Barnett remaining in parliament. Barnett has not gone quietly into the night. Rather, he has caused the new leadership team embarrassment by arguing that his premiership was hamstrung by an under-performing second-term cabinet, some of whom remain in parliament. Moreover, with the Liberals reduced to 13 members in a 59-seat chamber, and Barnett holding a safe seat, his exit would allow the party to refresh their ranks at a time when they are trying to rebuild. If we treat Barnett as a trustee, then the logic favours that he should stay in parliament until such time as his conscience moves him to quit. Under the trustee model, elected members are expected to be guided by their concern for the broader interests of the state. Once elected, the decision about how that member should serve these interests falls to the discretion of the member. On this basis, Barnett can reasonably argue that he is an experienced legislator who still has much to contribute to the parliament and to the state. Moreover, the high financial costs and general disruption associated with holding a byelection without proper cause is not advantageous to the people of the Western Australia. The delegate model requires the elected member to act according to the wishes of those who elected them. Unlike the trustee model, such assessments are not for the MP to make, but only after careful consideration of the views of the electorate. Based on this model, only the voters in Barnett’s seat of Cottesloe are fit to make any such decision about his future and, arguably, they have already done so when they re-elected him in 2017. Barnett’s claims in this regard are strengthened because he was elected on first preference votes (56.67%), and because he made clear his intention to remain in parliament regardless of the outcome of the election. This would suggest that Barnett’s electorate supported his reelection full in the knowledge of his future intentions. Thus, in the absence of any actions that would render Barnett unfit or unable to serve under the WA Constitution, the logic of the delegate model supports his remaining in parliament. In the end, the decision about Barnett’s future in parliament is for him to make. Neither the people of Cottesloe nor his own party can force him to resign. The Liberals can expel him from the party, but this does not solve the problem because what Barnett has said cannot be unsaid, and he may prove more of a distraction if freed from his partisan bonds. Yet what this incident, and others similar to it underline, is that any such disagreement over whether former leaders should remain in parliament often boils down to different views about to whom they are ultimately beholden. At the Western Australian election held 11 March, Labor won a landslide in the lower house, winning 41 of the 59 seats. However, in the upper house Labor and the Greens combined won 18 of the 36 seats, one short of an outright majority. There were two reasons for the left’s underperformance in the upper house: malapportionment in favour of rural regions and the group voting ticket system. There are six upper house regions, three in Perth and three in the rest of WA. Each region elects six members to the upper house, so the quota is 1/7 of the vote, or 14.3%. I wrote here that Perth only has half the upper house seats despite having 77% of the state’s population. However, the problem is worse than this. As Antony Green wrote, a voter in the deeply conservative Agricultural region has almost 4 times the weight of a Perth voter. A voter in the Mining & Pastoral region, which is becoming more conservative, has almost six times the weight of a Perth voter. At this election, about 49,000 formal votes were recorded in Mining & Pastoral region, 88,000 in Agricultural region and 194,000 in South West region. The three metropolitan regions had at least 334,000 formal votes each, more than the non-Perth regions combined. Although Labor’s vote improved across the state from 2013, Labor and the Greens combined won two of the six seats in Agricultural region, and just barely three of the six in Mining & Pastoral. In all other regions, Labor and the Greens easily won at least three of the six seats per region. Here is the final upper house results table. Vote shares and changes from 2013 are from Wikipedia. 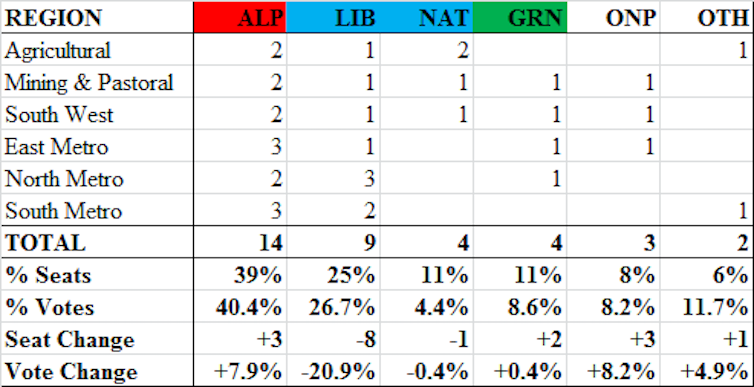 The table shows the effect of malapportionment, with the Nationals, who only contested the non-Perth regions, winning as many seats as the Greens on half the Greens’ vote. Others in the table are the Shooters in Agricultural region and the Liberal Democrats in South Metro. If all the non-Perth regions (South West, Agricultural and Mining & Pastoral) were combined, and non-Perth representaion reduced to six, Labor would have won 2.30 quotas, the Liberals 1.44, the Nationals 1.26, One Nation 0.80, the Greens 0.44 and the Shooters 0.33. With One Nation short of a quota, so they would soak up right wing votes, and Labor’s surplus going heavily to the Greens, the Greens would have been likely to defeat the Liberals for the final seat, resulting in Labor 2, Liberals, Nationals, One Nation and Greens one each outside Perth, rather than the actual result of Labor/Greens 8, all Others 10. There were three cases where a candidate who did not deserve to win won through the artificial preference flows under the group voting system, which is still used in WA. In Agricultural region, the Shooters, with 0.40 quotas, defeated One Nation with 0.82. 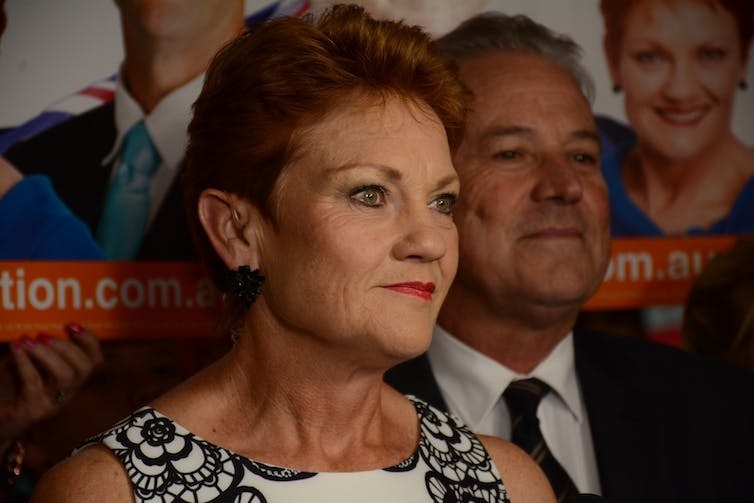 In East Metro, One Nation, with 0.56 quotas, defeated the 2nd Liberal, who had 0.75 quotas. So much for some people’s theories that One Nation would not benefit from group voting tickets. Most disappointing for the left, in South Metro the Liberal Democrats, with 0.27 quotas, defeated the Greens with 0.65 quotas. In that region, the Liberal Democrats were to the left of the Liberals on the ballot paper, and won 3.9% of the vote mostly due to name confusion. In all other regions, the Liberal Democrats were to the right of the Liberals, and won about 1%. The table below represents what I think would have happened had the current Senate system been used for the WA upper house, and the malapportionment removed. This would give Labor and the Greens 14 of the 24 seats. In this scenario the Greens would win four seats, to one for One Nation. This may seem unfair on One Nation, but the Greens benefited from Labor surpluses, while the Liberals had no surpluses to spare to help One Nation. Individual “Others” did not receive many votes, and none would have won if not for the artificial preference flows that only happen when parties, not voters, direct preferences. In the WA upper house, the President can only vote to break a tie. If Labor can persuade a non-Labor/Greens member to take the Presidency, Labor and the Greens would have 18 of the 35 votes on the floor. If a Labor member takes the Presidency, Labor will need the Greens and one vote from a right wing member to pass legislation. Former navy lawyer Mark McGowan is set to become the new premier of Western Australia. Labor’s victory is Perth-based. Thirty-five of the 40 predicted seats it won are based in the metropolitan area. Within the three non-metropolitan regions, Labor has held Kimberley and Albany, and likely picked up only three seats – Bunbury, Collie-Preston, Murray-Wellington. All, except Kimberley, are in the state’s south-west. 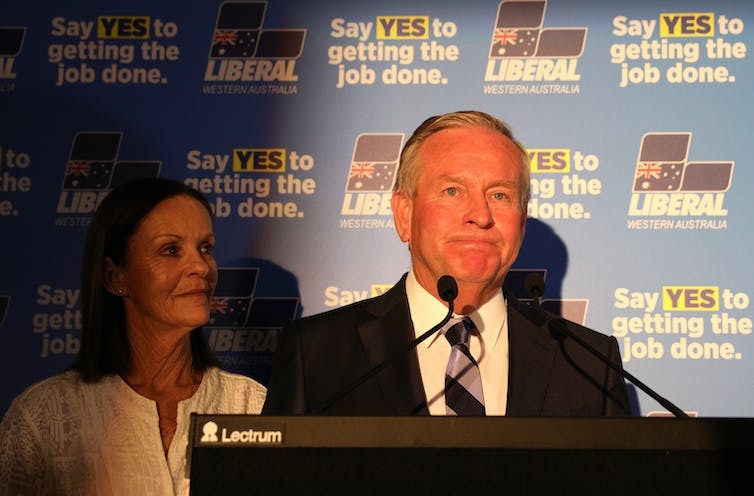 Outgoing premier Colin Barnett had become unpopular with voters.